Thirty-year-old tennis pro Vince Spadea's book is about the 2005 tour season - the players, coaches, fans, and women he encountered. He says at the time he, Agassi, and Henman were the only over thirties in the Top 20. I was a huge tennis fan and went to Wimbledon many times, the U.S. Open, Philadelphia, Queen's Club, Rotterdam, the Paris Open, Birmingham, Newport, and more, and although I recall the name Spadea, I don't remember his face. Sorry. The story of his life says Vince. It may be that I'd cooled my interest down by the mid-nineties. However, even though I held media accreditation at these tournaments, there were many players one didn't hear much about, and you heard even less about the actual goings-on on the tour. I even knew a player from my home town (a friend of my brother's) who was a doubles specialist on the tour from whom I gleaned scant info. So, it was extremely gratifying to have been able to read firsthand about what happens on the men's tour. Spadea not only talks about his own career but includes the role parents have on the tour (some good, some bad), many other players and anecdotes about them (nothing malicious or gossipy), the training and discipline that goes into becoming a great player, groupies and life on the road, their social lives, agents and sponsorshops/endorsements, the constant travel, the importance of a healthy diet, the media, and the mental aspect of tennis. Spadea writes about his losses too, not only wins, which is interesting and not so one-sided. I could have done without the rap I have to say. 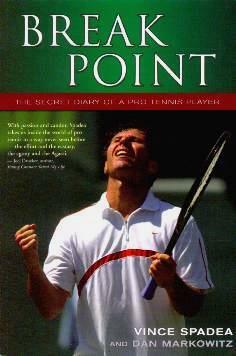 Conclusion - I enjoyed this interesting and rare look at the world of professional tennis. Very enlightening.